Hair & Makeup — HNL Photobooth Co.
Sarah is amazing at what she does. Her passion shows through her work. Sarah will not only make sure you look beautiful, but she will make sure you feel beautiful on your wedding day. She will work with you to get the look you want for your big day. Gemina and her team always go above and beyond, making sure they do a fabulous job while ensuring that her clients feel comfortable and relaxed. They take the extra mile to make sure their clients look their absolute best on their special day and treat their brides with utmost care. They're the glam squad you've been looking for. 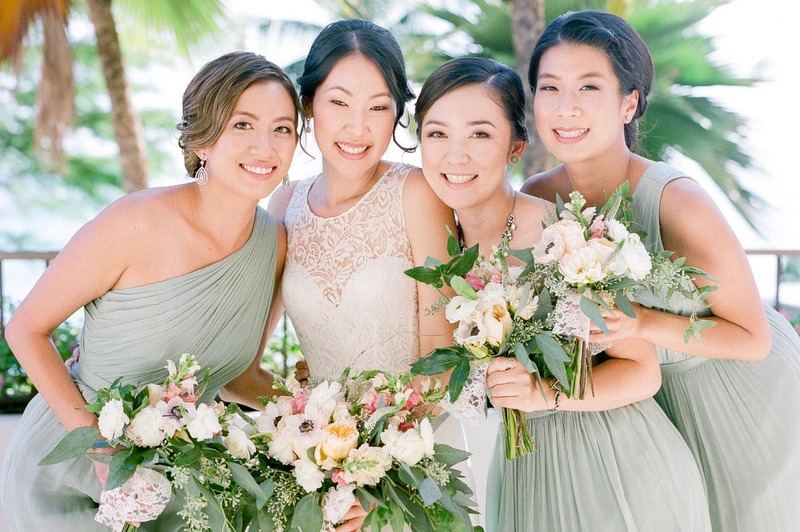 All brides should look great on their wedding day, and Christine delivers on that promise. Every bride wants to look picture perfect on their wedding day, Christine will guarantee that. She provides great service with wonderful results, sure to make every bride happy as they celebrate their special milestone. CJ is very professional, efficient, and does amazing work. Brides can't stop raving about her work and how she always makes her clients feel at ease and comfortable while on the makeup chair. CJ goes above and beyond to make sure that her brides receive great service and look absolutely radiant on their wedding day. Drybar specializes in blowouts, but also does hair masks, scalp massages, updos and braids. They are sure to give your hair a lot of TLC on your big day. They also do bachelorette parties so you can pamper yourself along with your girls! Their wonderful hair styling services can definitely help you achieve ultimate #hairgoals on your wedding day.